Hiring a limousine for the night can turn an average night onto the town into a special, romantic, exciting or adventurous experience. Limousines are vehicles that turn heads on a busy street, and pedestrians and other drivers will know that you are experiencing the night of your life. Limousines also command respect and authority, and the individual who is being transported by limousine is usually perceived as a powerful, influential or glamorous individual. When you decide to hire a limousine for your next event, whether it be a wedding, prom, party, or just a night on the town with friends, there are many different options to choose from. Different limousines express different ideas, and knowing your options will help you choose the perfect limousine for your event. You can easily find limousine services in your area that will tell you what types of limousines they offer and what the various rates are per hour for different vehicles. This guide to different limousine types provides details for a few of the basic limousine options. The most basic type of limousine is a town car or luxury vehicle. This vehicle is not easily recognizable or characterized as a limousine, but it is a type of limousine service. Typically, consumers who do not want to ride in a taxi cab or take public transportation will hire a town car or a luxury vehicle to transport them from one location to the other. Town cars are typically manned by professional drivers who know the proper etiquette and courtesy. They are also well-cleaned and kept in excellent condition. If you want to ride in luxury without appearing ostentatious or begging for attention, a nice, simple, elegant town car may be the perfect limousine for you. A stretch limousine is the most common type of limousine. This is the limousine that is most easily recognized on the streets of a big city. Stretch limousines come in many different lengths and automobile makes. Some limousines have multiple rows of passenger doors, and the seats are arranged in bench rows like a minivan or economy van. 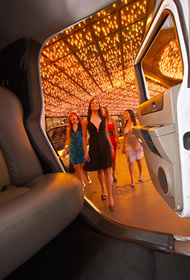 Other stretch limousines have only one set of passenger doors and the seats inside are arranged in a large circle for easy conversation and community. Stretch limousines can fit anywhere from five to twenty-five passengers depending on the size of the stretch limousine. You can usually find a limousine in either white or black. A new and popular type of limousine is the Sport Utility Vehicle limousine. These limousines are enormous and are made with the body styles of popular SUVs. SUV limousines are very commanding and impressive and often have a lot more leg room and stretching space inside. One of the most popular types of SUV limousines is the Hummer limousine. If you have ever seen a Hummer driving on the road, you know that it is already an impressive vehicle. When you consider the stretched out body of a Hummer limousine, you can imagine that it is one of the most impressive vehicles on any road. If you are a hopeless romantic or enjoy the idea of a trip back in time, you might want to consider hiring an old fashioned limousine. Antique limousines, like antique cars, are rare and valuable pieces of equipment that make bold statements when driven through a city. Antique limousines have a certain type of charm and are reminiscent of presidents, powerful figures, and philanthropists of the late 1920s. Another common type of limousine is the funeral processional limousine. This limousine is usually owned and operated by a funeral home and is used to transport members of the immediately family of the deceased from the funeral home to the burial plot. These limousines are often understated and simple, yet spacious and clean. Funeral limousines are great ways to keep the mourners together as they travel to the cemetery and prevent grieving individuals from being forced to drive. Whatever limousine you plan on hiring, you are in for a delightful treat. Limousines are fun and useful ways to transport large numbers of people, but don't forget to tip your driver!